Whenever we think of Hadrian’s Gate in Antalya, we always remember the kind traffic policeman who took pity on us the first time we ever drove to the city from Fethiye. All we knew was that our hotel was in Antalya old town. After accidentally jumping far too many red lights to remember (we were driving in convoy and the city ringroads were wide, packed with traffic and stressful – no time for noticing lights), we could finally see the castle walls and we drove round – and round – and round – and round. The castle walls were constantly to our right but how the hell did we get inside, where we needed to be? The situation was a cross between funny and frustrating but as levels of tetchiness began to rise after a few hours in a car that, at the moment, was getting absolutely nowhere, we spotted a traffic policeman on a motorbike by the side of the road. Right, time for our best Turkish and let’s see if we can follow the directions the policeman gives us. Yes, we understand the words you’re saying. We just don’t understand why you’re saying them to us. Don’t forget, we were in convoy. The policeman did a u-turn in the middle of a busy road and we (proper excited now) followed in hot pursuit while our friends, who had no idea what was going on, followed behind us. Blue sirens flashing, the bike then took a left up a one-way street – in the wrong direction! And we followed. And our friends followed. We were breaking rules but it was okay because we were following a policeman! Where we went from there I can’t remember, but the entrance wasn’t very noticeable and it was a turnstile where you have to pay to get through. This was all sorted by our new mate, the policeman, who then took us to our hotel as well. This was 4 years ago and I can’t remember if we bid fond farewells to our superhero or if he just rode off alone, into the distance. 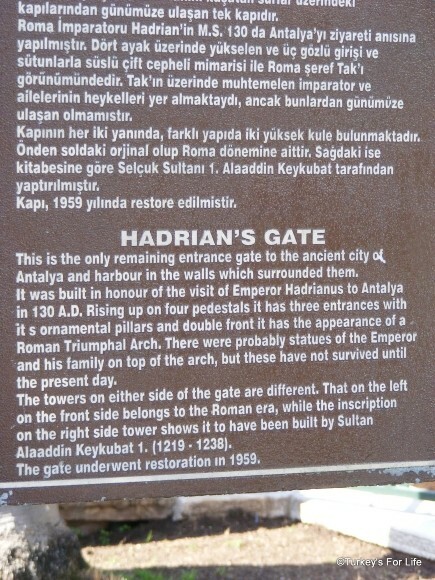 As you can see from the photos, passing through Hadrian’s Gate (Üç Kapı) is only possible on foot. Maybe the policeman was going to tell us the vehicle entrance was past Hadrian’s Gate but realised it was pointless when he saw the glazed-over look on our faces. 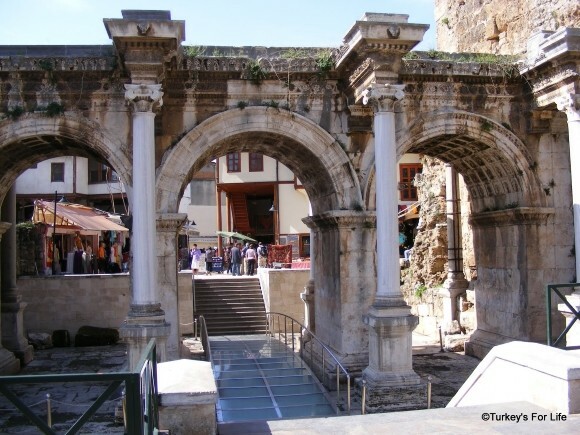 Hadrian’s Gate was only revealed in the 1950s after an earthquake caused the Selçuk walls to collapse. The gate had been encased inside the walls. Compare hotel prices in Antalya from multiple travel websites on Turkey’s For Life. Why Was I The Only Person Inside Izmir Agora? Oh my gosh, this totally reminds me of road trip to NYC with my folks when I was a kid. No matter how many times, my dad would get lost going from Manhattan to Brooklyn (I know, one bridge, right?) in the middle of the night…always after midnight. He’d pull up near a cop’s car asking for directions, and they would always pity us – this sleepy family in a big ole station wagon – and lead us to where we needed to go. Go NYPD. I love the policeman, the wrong-way driving and Hadrian’s Gate (and the earthquake). All the elements of a racy best-seller, I think! ha ha. Don’t you just love the Turkish Policemen?? One did my friend for riding without a helmet but he was not wearing one himself!! He went a bit red when we pointed it out! Isn’t it very Turkish of the policeman being a good example for “rules are for tourists” ? Loved this story and the kindness of the policeman and laughed about your comment “‘Why does the conversation never go well when we try to speak Turkish? '” as I wonder the same thing myself when trying to speak German. @ Laurel: We psyche ourselves up, plan the conversation in our head, and you can guarantee the person you’re speaking to will throw something into the conversation that completely throws you! 🙂 All part of the fun, I guess. Very nice of the policeman to help you out, I totally hear your frustration about the language, due to language barrier I ended up in Mongolia last August! Ok, from China, which is kind of closer, but still..! Same thing happened to us in Ghent in Belgium. Totally lost in the centre of the city and a policeman told us to follow him. Down a one way the wrong way and through a pedestrian only square!! Straight to our hotel. My last dealings with the Turkish police was last year when they gave me a spot fine for speeding on the way to Dalaman Airport!! But they were very pleasant about it!! @ MBS01: I think a lot of policemen like to be nice to foreigners so you get a good view of their country – even when they’re being pleasant while giving you a fine! 🙂 I never know which speed I’m supposed to be doing. A few more signs wouldn’t go amiss. Am I ever so glad that I can finally read you again- from Marbella. What a funny story and yes, the Turkish policemen are a friendly lot (ehmmm most of the time). Cute story!You guys got a glimpse of VIP life in Turkey- police convoys and all. I do want to applaud you guys for at least making an effort to speak in Turkish. I can almost see the video of this in my head – and the first awkward exchange with the police. Great story and love how getting lost can be such a good travel experience (thankfully 😉 ! This story is a perfect illustrations of two thruths about living in Turkey: 1. Learning Turkish is really hard. I often find that I know what the words mean, but still don’t understand what’s being said; and 2. There are no traffic laws in Turkey, just suggestions.